A day trip to Essaouira where there are excellent waves. Day trip to the Atlas Mountains. In the heart of the Medina there are many souks. 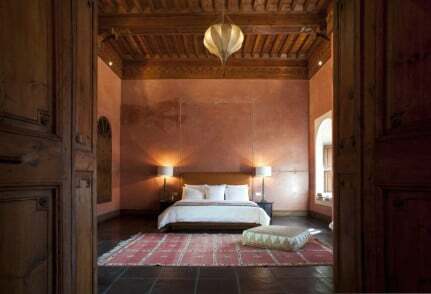 About the Riad, they love the decoration and the furnishing. They also love the romantic atmosphere, the serenity of the place. Most of the guests love Noir d’Ivoire as a retreat. Finally they love the attentive service and the discretion of it. We are located in the middle of the Medina, close to Jemaa-el-Fna square, the souks, the palaces & museums and the Majorelle garden. There are also a lot of outdoor activities : Atlas excursions, hot air balloon ride, off road activities, golfs. There is a night life as well, in the medina, Hivernage and Guéliz for all tastes. We serve a full breakfast including a Moroccan specialty. We propose every day a Moroccan menu and a French menu. Local places to recommend: there are a lot of them for any type of cuisine. Please see below a few of them. Master (Zebre), Grand Master (Panthère) & Honeymoon (Guépard) suites. They are located in the summer riad, overlooking the swimming pool and the waterfall. They have their own private terrace with a jaccuzzi. The riad is not really suitable for children. We prefer to have children above 12. We have a few suite where we can add an extra bed. Everything about this stylish riad in the heart of the medina is original, from the welcoming committee which includes Couscous the donkey, who carries your luggage from the drop-off point to the door of the riad, to the mobile phones that come with every room, for guests to take out with them in case they get lost and need to call 'home’. Top of the range spa has a traditional Hamman.